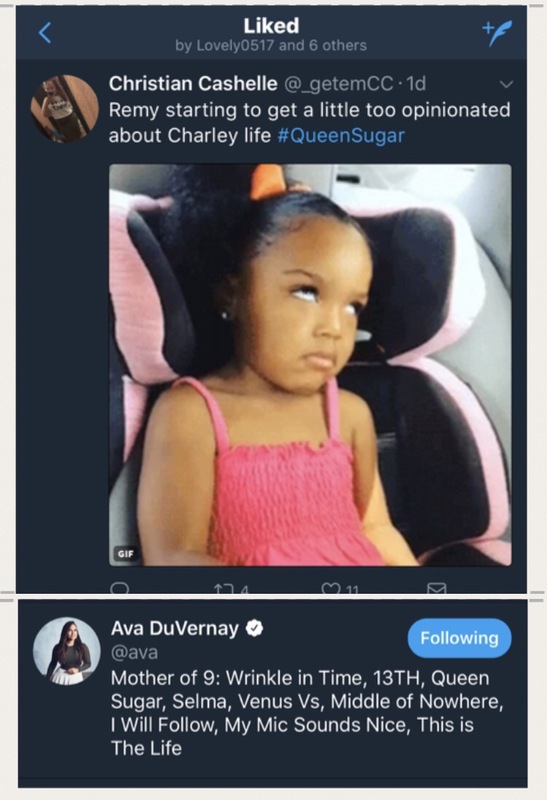 Ava DuVernay is my bestie…. This past Wednesday was the mid-season finale of Queen Sugar. If you haven’t been tuned in these past two seasons….unfollow me. No seriously, check it out if you haven’t. I wrote a review on Queen Sugar for Savor V’s Domestic Queens blog and every word is still true. However, after taking a few days to recover from the mind blowing, emotionally charged mid-season finale, God has given me a new outlook from two of the characters as it relates to recovery. So, I just had to come talk to my favorite people about it. I may not know everything about addiction and I often don’t understand it, but watching her deal with her recovery was amazing. Our biggest critic is always internal, but the Bordelon family was relentless in their efforts NOT to forgive Darla for her past. Whenever Ralph Angel even mentioned letting her see Blue, the family was not here for it. Darla had to deal with proving her recovery not only to herself, but to everyone else. She was very timid and often went along with things she wasn’t okay with in the name of acceptance. This season, however, I fell in love with her character. She took ownership of her life. She spoke up for herself. Darla made boundaries for everyone around her to protect her peace and her sobriety. We try so hard to convince people we are “recovered” but it is a daily, continuous, life long process. It’s never wrong to want to make amends to those we have done wrong, but at some point we have to decide that we’ve done all we can do for them and we have to forgive ourselves and live life. From the first episode, Charley felt like life. Brokenhearted from her husband’s scandalous infidelity and guilt stricken over a distant relationship with her father, Charley held so much of the weight of a black woman’s world on her shoulders. Even though my journey isn’t nearly as devastating as hers has been, I felt every decision and reaction she made from then on. Even when she did wrong, she could do no wrong. Watching her try to uphold the strong, black woman image while sifting through her life was a story all in itself. We could all see she needed sympathy, love, something…but it wasn’t until this season that she finally admitted it to herself and her family and it was amazing. One scene that sticks out to me is when she admitted to Aunt Vi that she needed help. That she needed someone to fight for her. That line….hit me hard. I often feel like no one fights for me. Let’s face it, no one is obligated to. The strong person is always left to fend for life on their own because people assume they have it. They can get through it because its the reputation they carry and the character they portray. Admitting you need something is a vulnerability that comes along with recovery. It’s imperative. It doesn’t make you weak at all. Quite the opposite. Recovery looks different for everyone. And that’s okay. Being able to own where you are and admitting that you need to move from that space is more than half of the battle. Don’t allow others to dictate how that looks for you. Oh, what does the first line of this post have to do with anything? Okay, so Ava DuVernay liking my tweet doesn’t ACTUALLY mean she knows me, but it’s pretty close! LOL. I had a mini panic attack. Don’t you just love Twitter? Don’t judge me. Every week! I cannot wait until October when the season picks back up. First of all, I just found the time to watch the mid-season finale last night. I loved everything about it. You’re right, the transition Darla’s character made this season was all about her recovery and I loved every moment of it. As for Charlie who can get on my nerves at times, I too felt like she can do no wrong for the most part because of everything she’s been though. I am soooo looking forward to the rest of the season! Some shows just shouldn’t take a break! Great piece. Queen Sugar is the best thing on TV! I didn’t care for Darla the first season either, but she became one of my favorites this season. She’s measured, smart and stands her ground. Charley’s probably my favorite character. I developed a soft spot for her midway through the first season. She’s got the most on her plate. Seeing her confront issues has been painful but necessary to watch. Let’s me know that vulnerability can be liberating. Yes, Charley is like so many women in my life and watching her gain the courage to address the things she’s going through is going to help a lot of people.